Differences between the SP and the book. • The drug that the character/s took to commit suicide in the book was Veronal. In the SP, it was Barbital. • In the book, Poirot was raising vegetable marrows, which means "squash" or "pumpkins" but with a difference in thickness in its skin. Honestly, I really had trouble understanding what exactly it is, so in the subs, I opted to use "pumpkins" to be safe since "marrows" might be just a British species and probably does not even exist in Japan. • In the book, head housekeeper Mrs. Russell was described as a lovely woman, who took care of the Ackroyd household efficiently, and was even rumored to be romantically linked to Mr. Ackroyd. It was discovered that when she was younger, she had a son out of wedlock, and named him Charles Kent, after the place where he was born (Kent, England). In the SP, the background of Raisen's son wasn't any more explained. • In the SP, the niece Hanako stole the money because her mother ordered her to do it. But in the book, Flora Ackroyd stole it out of her own volition. And unlike in the drama, the doctor wasn't enamored with her. • In the SP, the house guest was a famous writer. In the book, it was a famous retired serviceman who was also a big game hunter. • In the drama, the secretary planned to steal the money. But in the book, he had no chance to do so since he was instructed to lock that part of the house (the staircase and the study room) right after the incident. Instead, the secret that he kept was he had debt, and that was all. • With the butler, it wasn't anymore explained in the SP what he did at his former employ. But in the book, he blackmailed his former boss who was into drugs, and was involved in a fatal incident abroad. • The stepson in the book, Ralph Paton hid in a mental institution, which had some connection to the doctor. Poirot wanted to know about the boots he was wearing. In the SP, Hyodo Haruo hid in a mountain shrine. Suguro asked about the geta Haruo was wearing. • In the book, the village physician, Dr. James Sheppard blackmailed rich widow Mrs. Ferrars, and used the money to invest in stocks but lost most of it, and then asked her for more money. • Also his sister, Caroline wasn't ill. So it means, Poirot did not tell the truth of Ackroyd's death to protect Caroline from it. In the SP, the truth will be known once Dr. Shiba's sister Kana is dead from her illness. Btw, Caroline was the inspiration for Agatha Christie to come up with the character of Miss Marple, the amateur elderly spinster detective. The Mystery about the Time Setting. The Orient Express SP happened in 1933, while this SP took place almost 20 years later in 1952. But Suguro didn't look a day older. Based on what I found out about the actual Hercule Poirot stories, they did not follow a certain chronological order, and Agatha Christie did not specify dates when the stories took place. Hercule Poirot would say he is retired in one story, and years later, another new story would say he has yet to retire. So this means, Poirot's age (and other personal information) is a mystery. But why choose 1952 for this SP's setting? Maybe it's because the story has to take place after the war, so it can include the premise of a veteran soldier addicted to drugs. Or to factor in the Stimulant Drug Control Act which was put into effect in 1951. Japan's Post-War Drug Situation. Japan had a serious stimulant epidemic after the war, 1946 to 1956. The Stimulant Drug Control Act of 1951 was one of the measures to counteract the problem. For more info on this, you can read it HERE. Fukuin Fuku [復員服]. This translates as, "demobilization clothes", the clothes the drug addicted man was wearing. After the war, it seems veteran soldiers were given standard clothes by the government. These were khaki clothes with collars, and resembled the national clothes Japanese civilian men wear during the war. In the subs, I shortened it to "demob clothing", after the British term "demob suit". Nitsumaru [煮詰まる] VS. Ikizumaru [行き詰まる]. The writer Rando gave a lecture on these two terms. What Dr. Shiba wanted to say was Rando has "writer's block". But since such a term doesn't exist in Japanese language, he used the word "nitsumaru" (to be boiled down, to approach a conclusion). "Nitsumaru" is sometimes incorrectly defined as "to come to a standstill", that's why Rando corrected him. He said the correct term for "reaching an impasse" is "ikizumaru". Meitantei [名探偵]. It means "skillful detective" or "supersleuth". This is usually translated as "great detective". My problem with this translation is that "great" could also be understood as "famous". That's why I chose "superb" rather than "great". 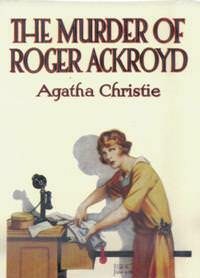 In the book, "Murder of Roger Ackroyd", Poirot was described as a "super detective" (I think it was Col. Blunt who said it but in a mocking way). But since Suguro's signature line is "Hai, meitantei desu! ", it seems "I am a super detective!" sounds kitschy, so I used "superb" instead. That Ending Tho. 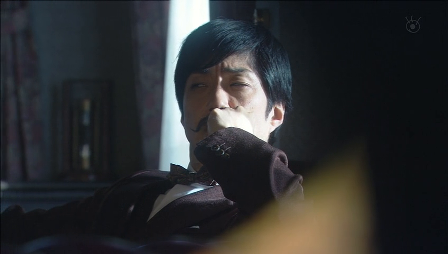 If you're wondering why Suguro looked fairly dramatic at the end, I was too. It seems too sudden and out-of-character, wasn't it? Then, I realized why when I heard about how Hercule Poirot met his end in the last book, "Curtain: Poirot's Last Case". I guess the drama wanted to give a hint of Suguro's growing guilt from some of the controversial actions that he had taken, and the inner turmoil that he's hiding behind his somewhat comical, cheerful exterior... maybe to be tackled in more future SPs? The Kuroido House. 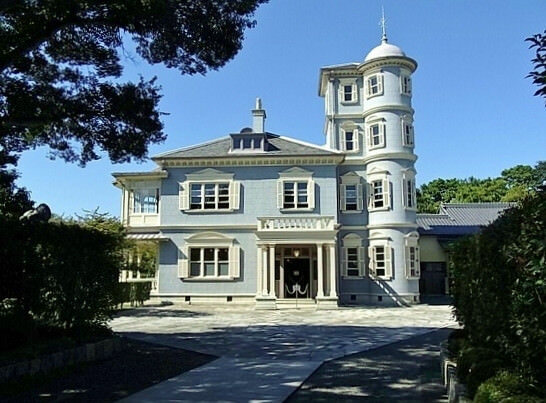 The exterior shots of the Kuroido house was that of Rokka-en, a mansion built in 1913 in Kuwana, Mie Prefecture. It seems the color of the facade was changed from blue to brown via CGI effects. What I find amazing was, I've seen pictures of the interiors of the Rokka-en mansion, and it didn't look like the one in the SP. This means the interior of the Kuroido House was actually inside an elaborately designed studio set. So if you watch the SP starting at 27:50, you will see actor Oizumi Yo's stuntman or double, riding the bike and stopping in front of the actual Rokka-en mansion, but as he rings the doorbell at 28:05, the scene smoothly cuts to that of the real Oizumi Yo, standing in front of what seems to be an exact replica of the porch and doorway, inside the studio. Suguro's House. Suguro was renting the house next door to the Shiba's. The exterior of Suguro's house was that of the Former McKenzie House of Suruga Ward, Shizuoka City, Shizuoka Prefecture. Tonosato Village. The idyllic scenery where Shiba was seen riding his bicycle was mostly shot in Gotemba, Shizuoka Prefecture. WOw, I need to search for it ASAP! I never know about this!!! where would I search for it! !where should I go first!!! That dramatic ending confused me too, but then again when I heard they were gonna do this SP, I thought it was interesting that they chose another one where the killer didn’t get caught. So I guess the ending kinda makes sense.